This program is a requirement for any contractors working on a Saskatchewan Mining Association member (mine) site in Saskatchewan. This program is offered with instructor support in a classroom environment or on site. The program provides an overview of mine safety through 13 modules over 14 hours. Fit for duty and drug and alcohol testing. 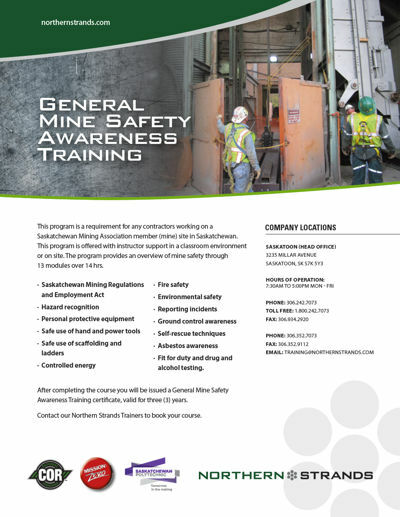 After completing the course you will be issued a General Mine Safety Awareness Training certificate, valid for three (3) years.